Poured wax: Very desirable because of the ability of wax to mimic skin. Therefore they resulted in the most beautifully realistic heads. After the wax was poured into warm molds, the hair, and glass eyes were set in the head. The head was then glued to bodies generally made of stuffed cloth with wax limbs. Wax over papier mache or composition: A moulded mask, made of papier mache with a wax covering complexion, was achieved by applying watercolor paint. Hair made of flax or human hair was affixed to the head through a slit in the wax. Eyebrows and mouth were painted. 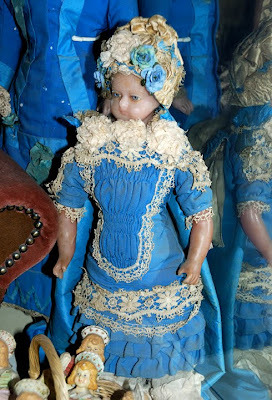 Most of these dolls had glass eyes, large and dark with huge pupils and no iris. Reinforced wax: Similar to wax-over dolls, but with several coats of wax creating a top quality wax doll that looked like the expensive Poured wax. This combination of wax and composition is not a happy one. 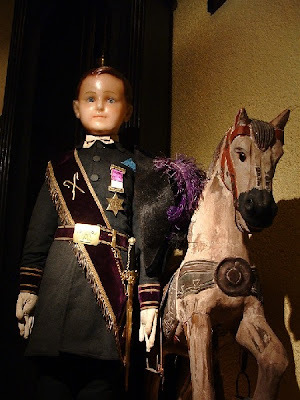 The dolls you find are almost always cracked, the composition warps with time causing the brittle wax to crack. 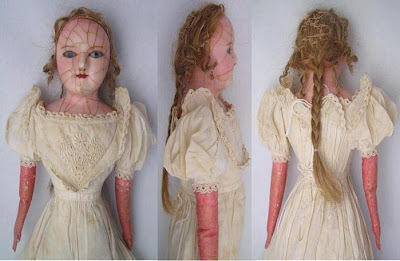 The charm of these dolls lies in the patina they have acquired and while is permissible to replace chipped off pieces of wax, they do not respond well to restoration. Their flattened noses and prim faces look far better when left with their full compliment of cracks acquired over the years. Labels: Wax Over showing cracks obtained over time.